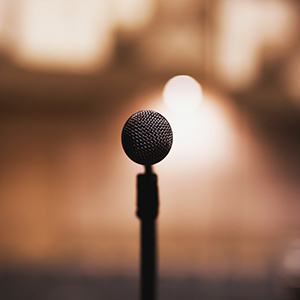 Imagine you’ve agreed to do a presentation … even though you’re one of the 75% of people who experience some degree of anxiety or nervousness when public speaking. It somehow feels like parading around naked, and you’re worried the audience will notice that you, in fact, are not wearing clothes. How do ordinary people catapult themselves to “expert” or “guru” status just by opening their mouths? Having been a keynote speaker for more than 50 events, I’ll offer some clues to help you cloak your presentation anxieties. Don’t “write a speech”. Break down a speech into elements: facts/stories/lessons learned, etc. For a timed speech, determine how many minutes to devote to each element (1-3-5 minutes). Prepare an outline. Graphic slides are helpful as a topic transition trigger. Time each slide accordingly. As PowerPoint automatically moves to the next cue slide, transition to that topic. Experts predict that if you practice a speech 10 times, you’ll be able to give an hour speech without any notes! And you might be versed enough to even dump the PowerPoint. Forget reading a script. Look at the cue slide and practice telling or explaining. Use cue slides to illustrate, not to inform. Don’t sneak your notes onto slides. It is just as bad to read from a slide as from a piece of paper. And no, the use of bullet points doesn’t negate the “no notes” rule. A 30-point font for room-wide visibility is necessary if you MUST use words (for example, for a verbatim quote). Even then, try to limit words to no more than 7 per slide. Avoid sales messages and humble-brag. Nothing turns off an audience more than marketing your company or even yourself during a presentation. You don’t need your logo on every slide. Be sure the facts and sources you quote are correct — someone in the audience will be an expert and call you on a mistake. Edit. Edit. Edit. When taking your audience on your message journey, remember that not everyone wants to know where you stopped for gas. Have you shared enough details to describe the scenery without cluttering up the view with unimportant trivia? Use metaphors and/or personal language to connect with the audience. Avoid “intellectual” language which actually will distance you from the audience. Model passion for your topic. Project energy – movement, not frenetic pacing. Step out from behind the podium and speak from the heart, which conveys confidence and knowledge. Mentally divide the group into thirds and make sure you make eye contact with someone in each section several times over the course of your speech. In that way, tell your story to one person, not 100. It works to settle your nerves and keep the audience interested. You get what you inspect, not what you expect. Test audio and video equipment and laptop. Bring an extra thumb drive. Ask folks to turn off cell phones by turning yours off as an example. Then relax and do what you set out to do – inform, educate, influence, and enjoy great speech evaluations afterwards!